Ever wandered by a cycle studio at the gym, heard the pumping music and curiously peered through the window at the mass of sweating bodies pedaling furiously? Intimidated? Don’t be! Group cycling is a great way to build cardio endurance while blasting calories – and best of all, doing it at your own pace (you control your intensity!). Before you jump into your first group cycle class, here are a few helpful tips from the Eagan Y’s Healthy Living Director and Cycle Instructor Extraordinaire, Tiffany Rittler-Foley. 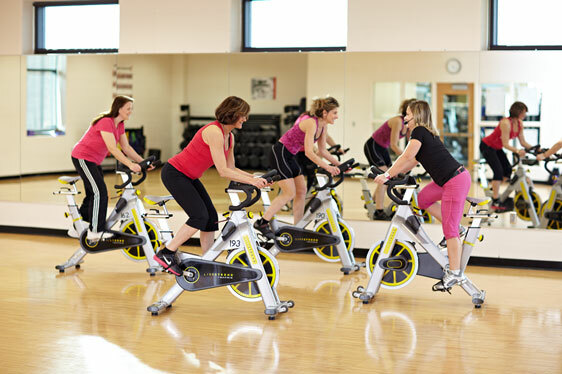 Try one this week – and make group cycle a part of your 2014 health and wellness routine. I’m nervous about taking my first class. What can I expect? Group cycle is less intimidating that you might think. It is simply riding a bike! Just like you when you were a kid. The instructor is there to be your guide and set a course for you – but it’s your workout and your class time, so if you have another course that you would like to take, by all means do so. What type of skill level do I need to take a group cycle class? One of the coolest things about Group Cycle is that anyone can do it! It requires no special skills. Unlike a treadmill, there’s really no balance, or danger of falling off. If you can walk….you can cycle. Heck, you don’t even need to stay on the beat of the music. What should I look for in an instructor? It’s important to find an instructor you like who matches your musical taste and personality so that it’s fun for you. Try attending as many different classes as possible until you find that special connection with an instructor. Cycle shoes are recommended but not required! However, the investment is 100% worth it. You will get more out of the class with them. You will need water and a sweat towel. You’re going to sweat! Don’t give up. You’ll probably be sore in the saddle after your first class, but don’t let that keep you from coming back. After a few classes, your body will adjust. Pay attention to bike setup. Setting up your bike properly will help you have a more comfortable and enjoyable experience. When riding, keep your shoulders down, core engaged, and feet flat. Be comfortable on your bike! Seat: Get on the bike and put your foot into the cage above the pedal. Then pedal forward and stop at the bottom of the pedal stroke until your legs are fully extended with a slight bend in the knee. The bike seat moves forward and backward as well. Sit down in the saddle and lean forward. Put your hands on the handlebars with elbows bent slightly and pedal, then make sure your front knee is over the center of the pedal. Handlebars: Start with handlebars a little higher than seat height. Pedals: Slide your foot into the cage and tighten the foot strap. The ball of your foot should be in the center of the pedal. Don’t forget to note your bike settings – jot it down somewhere or take a mental note so you’ll be all ready next time.